Final judgments were entered against JBI, Inc. and John W. Bordynuik, "two defendants in a fraud action filed by the Commission in 2012." In its original complaint (PDF), the SEC alleged that JBI, Bordynuik (JBI's former CEO) and Ronald Baldwin Jr. (JBI's former CFO) engaged in a scheme that allowed JBI to state "materially false and inaccurate financial information on its financial statements." JBI and Bordynuik have consented to final judgments that permanently enjoin them from future violations of the Exchange Act and Securities Act and order them to pay $160,000 combined in civil monetary penalties. The final judgment against Bordynuik also places a five year officer or director bar against him. The case against Baldwin remains pending. Orders were entered dismissing all claims against relief defendants Lee H. Corbin, Maria T. Checa and Checa International, Inc. in the action Securities and Exchange Commission v. Matthew C. Devlin, et al. The SEC's original complaint alleged that these defendants received illegal gains from "a long-running insider trading scheme orchestrated by Jamil Bouchareb and Daniel Corbin." The court orders "were based upon stipulations of dismissal with the relief defendants who no longer possess any illegal gains" from the scheme. According to the complaint (PDF), Imaging3, Inc. and its founder, Dean Janes, misled investors "about the Federal and Drug Administration's view of the company's medical imaging device." In November 2010, Janes held a conference call with investors after the FDA had denied clearance for the company to market this scanner for the third time. Janes allegedly "told investors that the FDA's issues were 'not substantive' and largely 'administrative,'" when in fact, the FDA's "concerns were 'safety-related.'" The SEC has charged the defendants with violating sections of the Exchange Act and seeks "to bar them from future violations of federal securities laws, require them to pay civil monetary penalties, and bar Janes from serving as a public company officer or director." According to the complaint (PDF), Your Best Memories International Inc. and its president, Robert Hurd, misled "investors in Your Best Memories about how their funds would be used and [made] misleading statements that one of the products touted to investors had received approval from the U.S. Food and Drug Administration as a treatment for Alzheimer's Disease." Additionally, Your Best Memories allegedly raised almost $1.2 million in an unregistered offering of securities. Kenneth Gross has been charged with "selling Your Best Memories stock without being registered as a broker-dealer." While investors had been told their funds would mainly be used to "fund the development and marketing of Moving Pictures' memory enhancing products," only 17% of these funds were "forwarded to Moving Pictures for their intended purposes." The SEC has alleged that Hurd "funneled at least 37% of investor funds to himself, by transferring money to another of his companies, Smokey Canyon Financial, Inc., or simply by making cash withdrawals of investor funds." Additionally, Hurd and Your Best Memories also used investor fund to allegedly make Ponzi payments. The SEC has charged Hurd, Your Best Memories, and Gross with violating sections of the Securities Act and Exchange Act and seeks permanent injunctions, and payment of disgorgement with prejudgment interest and civil penalties. The complaint also names Smokey Canyon as a relief defendant and seeks disgorgement and prejudgment interest against it. We've been discussing markups a lot on the blog recently -- including an entire week devoted to markups in municipal bonds. Yesterday FINRA announced that it fined StateTrust Investments and their head trader, Jose Luis Turnes, for charging excessive markups and markdowns on hundreds of corporate bond transactions.1 The letter of acceptance, waiver and consent (AWC) is available here (PDF). According to FINRA, StateTrust charged prices customers much more, or paid them much less, than the prevailing market price between March 2007 and June 2010. In some cases, the markups/markdowns charged on the trades were in excess of 23%. FINRA found that StateTrust failed to adequately supervise their head trader and failed to report several transactions to FINRA TRACE system. FINRA also found that the head trader failed to properly price the bonds and relied upon the Bloomberg terminal or telephone calls. The excessive markups and markdowns on these transactions were not properly disclosed to clients in trade confirmations or account statements. In total, FINRA found that StateTrust had charged more than $336,000 in excessive markups and fined the firm more than $1 million dollars. StateTrust has been ordered to pay restitution and interest to compensate investors for the excessive markups the customers have been charged. This action should encourage investors to be mindful about the prices they are paying, or the prices they are being paid, for securities. 1 A markup is the difference between the price a customer pays to buy a security and the prevailing market price. On the other hand, a markdown is the difference between the prevailing market price of the security and the price the customer receives for selling the security. It is often expressed as a percent of the prevailing market price. Structured products are often linked to well known indices like the S&P 500 (PDF) or the Dow Jones Industrial Average (PDF), but recently it has become more and more common for banks to issue structured investments linked to proprietary indices that they create themselves. The use of proprietary indices (also known as 'self-indexing') has begun to arouse suspicion from various sources and so we thought we'd take a step back and talk about the issue for a moment. Structured products linked to well-known indices or stocks are considered easier to market since the indices are widely quoted (on the evening news for example) and fully described by the index provider (S&P, Russell, MSCI, etc.). Investors benefit from the independent and transparent nature of these widely distributed indices. The downside for issuers of using an S&P, or a Russell or an MSCI index is that there are licensing fees. Although the marginal fees for more frequent issuers tend to be small, these licensing fees can amount to a few basis points (100 basis points = 1%) and can eat into the profits of less-frequent issuers. In light of these fees, banks are more frequently testing the waters with in-house indices. Using proprietary indices benefits banks by decreasing fees paid to index providers, but at the cost of transparency to the investor. Take as an example JP Morgan Chase Bank. This bank has been issuing a number of structured certificates of deposits linked to proprietary indices like the JPMorgan ETF Efficiente 5 Index (here's an example CD). If you've never heard of this index, you're not alone. According to the SEC filings for the index, it allocates between exchange traded funds based upon a momentum strategy with a volatility target of 5%. "Investors can access the index via J.P. Morgan-issued certificates of deposits and notes, each of which is subject to the credit risk of the particular issuer." In other words, there isn't much else out there that references this index. When complex in-house indices are used over transparent and independent indices, there is a possibility for investor abuse. Rosa Abrantes-Metz, an NYU expert on benchmarks, states that "any institution that has a direct financial interest in the value that a benchmark takes should not be responsible for administering such a benchmark, especially if they are not based on actual transactions." The risk is that the issuer may use its informational or discretionary advantage to increase the profitability of its products at the expense of investors. Indeed, it is very difficult for investors to value structured products linked to proprietary indices, as the relevant market information is often not available. It should be noted that some of the most vocal opponents of proprietary indices are, not surprisingly, the index providers themselves. The use of proprietary indices reduces their revenues and diminishes the prominence of their benchmarks. In this particular case though, it seems that the interests of the investor and of the independent index provider might be aligned. We've talked a lot about real estate investment trusts (REITs) before. In the US, REITs are companies that invest at least 75% of their assets in real estate, pay out almost all of their annual income in dividends, but also pay little or no corporate income tax. As we've discussed before, many companies have tried to qualify for the REIT designation to reduce their tax liabilities, even if their business is only peripherally related to real estate.1 This 'REIT conversion boom' has been controversial, and according to a recent Law360 article, might be drawing scrutiny from the IRS. Most REITs own properties such as apartment, office, industrial, or hotel buildings. Some own less traditional real estate properties; for example, Public Storage (PSA) is a publicly traded REIT that owns and operates self-storage facilities. Some REIT applications, however, have stretched the definition of real estate even further: prison operators, telecom companies, data centers, and even landfills have applied for REIT status with some success. There is some concern that companies are abusing the REIT designation to avoid corporate taxes. Many attorneys are bracing for the IRS review to result in narrower class definitions, and several expect the uncertainty before an IRS opinion comes down to dampen the recent fervor for REIT proposals. But, in the longer run, the results of the IRS review could end up bolstering the asset classes that are given a clear thumbs-up and will shave down the time it takes for the IRS to handle REIT applications, some experts told Law360. The article notes that even Congress might get involved, and may clarify whether the REIT designation should only apply to traditional (or 'core') real estate properties, or if it can also be extended to non-traditional properties as well. 1A recent example that made headlines involves Iron Mountain (IRM), which is basically a document-storage company. Reverse convertibles are short-term debt securities issued by banks whose return of principal at maturity is contingent upon the returns of the linked stock. Although these notes typically pay relatively high coupons, they expose investors to losses on the underlying asset, especially if those losses are beyond the trigger level. Academic research shows that these coupons are not adequately compensating the investor for the market risk that they are bearing by investing in the notes. For more information about reverse convertibles, see the collection of posts we have on the subject. A few years ago, SLCG wrote a white paper (PDF) about a reverse convertible note issued by JP Morgan in May 2010. What made this particular reverse convertible (PDF) interesting is that JP Morgan issued the note almost simultaneously with the US Appeals Court decision to rehear a case concerning patent litigation between TiVo (TIVO) and Dish Network. The following figure illustrates the timeline relevant for this note. Investors in the JP Morgan notes were exposed to the risk that TiVo would experience an adverse litigation event during the term of the notes. Following settlement of the notes, the stock price dropped over 40% and the notes breached the trigger level (dotted red line). Although the notes paid a 64.25% annualized coupon, investors in the notes experienced an annualized loss of 96%. This example demonstrates that banks can and do issue structured products around events that could adversely affect their value to investors (events about which the bank likely has much better information). We wanted to point out another example of such an exposure to highly volatile stocks. Consider the JP Morgan reverse convertible tied to MetroPCS Communications (PCS) issued on July 27, 2011. The note was issued just three days before the August 2, 2011 earnings call and quarterly SEC filing from MetroPCS. MetroPCS's stock price tumbled 37% after " the company missed Wall Street forecasts for its sales, earnings and subscriber growth." MetroPCS's stock price breached the $12.92 trigger level (dotted red line) and never again returned above the trigger during the term of the notes. Investors realized an annualized loss of 57% on their investment in the notes. To see just how significant this drop was, we plot the range of probable levels for PCS based on the risk-free rate, dividend rate, and implied volatility as of the pricing date. We also plot the range of probable values based on the August 2, 2011 closing price. As of the pricing date, there was a 70% probability that MetroPCS's stock price would be above the trigger at maturity -- in which case the investor would receive their principal investment (subject to credit risk of course). After the announcement, there was a 77% chance that MetroPCS's stock price would be below the trigger at maturity -- in which case the notes would convert to MetroPCS stock. Both the TiVo and MetroPCS reverse convertibles were effectively bets on specific events, bets for which JP Morgan likely had superior ability to determine the odds. That kind of information asymmetry between banks and investors contributes to the mispricing we commonly observe in the structured product market. For more examples of structured product valuations and analysis, please see our database of over 17,000 structured products, including 10,000 reverse convertibles. The Financial Industry Regulatory Authority (FINRA) recently released an investor alert entitled "Alternative Funds Are Not Your Typical Mutual Funds". FINRA defines Alternative (Alt) Funds as mutual funds that "seek to accomplish the fund's objectives through non-traditional investments and trading strategies." These funds have garnered significant assets in recent years -- over $175 billion as of May 2013 -- as investors stretch beyond traditional stock and bond allocations for additional yield. According to Reuters, FINRA is particular concerned about mutual funds that "that turn around and invest in shares of hedge funds." Hedge funds, unlike mutual funds, are not subject to the provisions of the Investment Company Act of 1940 (PDF) and as a result have essentially free-range over the types of strategies and investments they may consider. These investments frequently include obscure, illiquid and/or risky assets that would typically be unsuitable for a retail investor. Alternative fund strategies are sometimes marked by high turnover, which can be a drag on performance due to transaction costs. In addition, managers of alternative funds may have higher expense ratios since running their funds may require more skill (read: compensation). There is also no guarantee strategies (or managers) that have performed well in the past will continue to do so. In fact there is little evidence for persistence in active strategies at all. Even if a persistently successful strategy was found -- as pointed out by a recent Barron's story -- the assets underlying these strategies would typically become more expensive as other managers mimic the strategy, diminishing realizable returns over time. Alford: Due diligence is crucial, but many advisors don’t have experience with alternatives. With traditional alternatives such as hedge funds, managers do not offer much transparency into portfolio positions or investment process, making these investments difficult to evaluate....The stakes are high for picking the wrong managers. Raby: Educating clients on the nuances of alternative funds. Bregman: The biggest challenge is fully understanding the risk-and-return opportunities of particular strategies in particular market environments. It's important to realize that there are several levels of complexity that both advisors and investors need to understand. They must understand the alternative fund itself, its purported role in the client's overall portfolio, as well as the investments underlying that fund. Investors are also encouraged to check the background of the fund manager using FINRA's BrokerCheck system. Last Friday evening we posted a comprehensive report on municipal bond mark-ups. This week we’ve had several posts covering topics within our report. We’re wrapping up the week with an example which illustrates some of our observations. In February 2005 the City of Carlsbad issued $33,085,000 in tax exempt bonds underwritten by a Stone & Youngberg. This small San Francisco-based brokerage firm specialized in municipal finance and was recently bought by Stifel Nicholas. The Offering Circular is available here. The issue included $10,840,000 in 5.2% bonds due September 2, 2035 issued at $99.694 to yield 5.22%. The trading in this series is available here. The bonds were sold to investors between February 2, 2005 and February 8, 2005 on a when issued basis to settle on February 17, 2005. We capture a screen image of the MSRB EMMA trades below. 42 small trades were done over 5 or 6 days at exactly $102.319. The average inter-dealer price during this period was $100.00 and so the markup charged against this benchmark was 2.32%. Excluding these 42 customer purchases done at exactly the same price, the average customer purchase price was $99.69 and so the 42 investors who were sold these bonds paid $2.63 more than investors buying the same bonds at the same time. Can a markup of 2.3% to 2.6% be justified on these trades? Almost certainly, No. This difference cannot be explained by the relatively small sizes in the 42 suspect trades since there were also trades of $10,000, $20,000, $25,000 and $50,000 all executed at $99.692. The 42 trades must have all been done by the same broker-dealer because of the uniformity of the $102.319 price. This spread is over $25,600 and reflects either additional compensation beyond the disclosed spread to the underwriter, Stone & Youngberg, or a riskless profit earned by a different broker-dealer who purchased $1,000,000 at $100 and was selling the bonds instantaneously at $102.319. That the 42 trades were done over 5 or 6 days and at the same price to the tenth of a penny makes clear that the dealer determined the price customers would be charged and sprinkled the bonds throughout customer accounts. These trades highlight potential abuses which are difficult to spot with just the public facing EMMA data we’ve been reporting on this week. For example, imagine this trading by the same dealer in 42 other similar bonds. If the dealer purchased $975,000 in one bond in each of the 42 accounts a 2.6% markup would be clearly excessive. Even breaking the 42 $975,000 positions into 126 $325,000 trades sprinkled 3 trades into each of 42 accounts would not be disperse enough to make the 2.6% markup appear not excessive. The trading in small lots we observe in this bond may have been purely to disguise the excessiveness of the markups being charged. We see other examples where almost the entire series is sold at a substantial markup to the IPO price by the underwriter. In many cases, the markups are earned by the underwriter swamp the disclosed underwriter spread. Issuers need to be as concerned about these markups as investors. Issuers should check the early trading in their newly issued bonds to make sure the underwriters and advisors haven’t caused them to significantly underprice their bond offerings thereby wasting taxpayer money. A final judgment was entered against Robert W. Kwok, a former Senior Director of Business Management at Yahoo! Inc., for allegedly trading on nonpublic information "concerning Yahoo and Moldflow Corporation." According to the SEC, in April 2008 Kwok learned of an upcoming acquistion of Moldflow by Autodesk, Inc. from Reema Shah, "a former mutual fund and hedge fund portfolio manager at RiverSource Investments, LLC." Kwok gained approximately $4,750 in illicit profits from the trading. Additionally, Kwok allegedly tipped Shah in 2009 about "an upcoming announcement of an internet search engine partnership agreement between Yahoo and Microsoft Corporation." A judgment was previously issued that ordered injunctive relief against Kwok and barred him from serving as an officer or director of a public company. This final judgment orders Kwok to pay over $10,000 in disgorgement, prejudgment interest, and penalties. In a parallel criminal case, United States v. Robert Kwok, Kwok pled guilty "to conspiracy to commit securities fraud and was sentenced to two years of probation and ordered to forfeit $4,754 and pay a fine of $1,000. " Last week, the SEC charged Whittier Turst Company and fund manager Victor Dosti with participating in "an insider trading scheme involving the securities of Dell, Nvidia Corporation, and Wind River Systems." Dosti learned of the insider information from Danny Kuo, "a Whittier Trust fund manager who Dosti supervised." The SEC has charged the defendants with violating sections of the Exchange Act and Securities Act. Whittier Trust and Dosti have agreed to pay almost $1.7 million in disgorgement, prejudgment interest, and penalties to settle the charges. An application was filed this week by the SEC requesting an order "to enforce investigative subpoenas served on Bridge Securities, LLC, Bridge Equity, LLC, Bridge Equity, Inc. and FOGFuels, Inc." All of these entities are under the control of Paul James Marshall. In March 2013, the SEC issued "a Formal Order Directing Private Investigation entitled In the Matter of Bridge Securities, LLC." According to the SEC, "the four entity respondents have failed to comply with validly issued and served subpoenas for documents relating to this investigation, which involves" the possible offerings and sales of unregistered securities interests in "one or more of the entity respondents." According to the complaint (PDF), brothers Andrew W. Jacobs and Leslie J. Jacobs II tipped and traded on insider information regarding "a pending tender offer for Chattem, Inc. securities." A. Jacobs gained the inside information from his brother-in-law, "who was at the time a Chattem executive." His brother-in-law "requested that A. Jacobs keep their discussion confidential." However, the next day A. Jacobs allegedly called his brother who then traded on the information, gaining almost $50,000 in illicit profit. The SEC has charged the defendants with violating sections of the Exchange Act and seeks permanent injunctions and payment of disgorgement, interest, and penalties, as well as an officer and director bar against A. Jacobs. Last week a preliminary injunction was entered against Blake Richards with allegations including "misappropriat[ion of] approximately $2 million from at least seven investors." The majority of these funds were "retirement savings and/or life insurance proceeds from deceased spouses." The complaint alleges that Richards used these funds for personal use. A final judgment was entered against Emanuel Goffer last week for his alleged involvement in an insider trading scheme. In its original complaint, "the SEC charged nine defendants, including Goffer, a former proprietary trader at the broker-dealer Spectrum Trading, LLC, with insider trading ahead of corporate acquisition announcements." The tips were about the acquistions of Alliance Data Systems Corp., Avaya Inc. and 3Com Corp. Emanuel Goffer gained over $1.3 million in illegal profits by trading on the information that he received from his brother, Zvi Goffer, who in turn received the information from a Ropes & Gray LLP attorney. Goffer has agreed to be permanently enjoined from future vioaltions of the securities laws, and to pay over $1.5 million in disgorgement and prejudgment interest. "The disgorgement obligation will be off-set in part by a forfeiture order in a related criminal case, and the remainder waived in light of his financial condition." Goffer also consented to an "SEC order barring him from association with any broker, dealer, investment adviser, municipal securities dealer or transfer agent, and barring him from participating in any offering of a penny stock." In the related criminal case, United States v. Emanuel Goffer, Goffer was convicted of "securities fraud and conspiracy to commit securities fraud, and was sentenced to three years in prison and ordered to forfeit $761,623." According to the complaint (PDF), Chauncey C. Mayfield, "the founder, president, and CEO of MayfieldGentry Realty Advisors," stole almost $3.1 million from "the pension fund that the firm manages for the city's police officers and firefighters so he could buy two strip malls in California." Additionally, the SEC has charged chief financial officer Blair D. Ackman, chief operating officer Marsha Bass, chief investment officer W. Emery Matthew, and chief compliance officer and general counsel Alicia M. Diaz for helping Mayfield conceal the theft. Mayfield allegedly stole the funds in 2008 and used them to purchase shopping properties and "title them in the name of a MayfieldGentry affiliate." "The stolen money could have provided a year of benefits for more than 100 retired police officers, firefighters, and surviving spouses and children." When the other defendants became aware of the scheme, they feared losing the business received from the pension fund and "devised a plan to secretly repay the pension fund by cutting costs at the firm and selling the strip malls." However, MayfieldGentry failed to raise enough capital to replace the stolen funds. The defendants continued to cover up the scheme, though, until "they finally informed the pension fund on the evening before the SEC filed a complaint against Mayfield and his firm in May 2012 for their participation in a "pay-to-play" scheme involving the former mayor and treasurer of Detroit." The pension fund "promptly terminated its relationship with MayfieldGentry." The defendants have been charged with violating and/or aiding and abetting the violation of various provisions of the securities laws. They have agreed to pay almost $3.1 million to settle the charges. "In a parallel criminal matter, Mayfield is awaiting sentencing in connection with his guilty plea for participation in the pay-to-play scheme." Final judgments were entered against China Natural Gas Inc. and its chairman and former CEO, Qinan Ji, for "loaning company funds to benefit Ji's son and nephew while failing to disclose the true nature of the loans." According to the SEC, China Natural Gas failed to disclose in 2010 that it loaned $14.3 million to Ji's son and nephew to benefit a real estate company that the two owned. Additionally, in 2008 China Natural Gas allegedly "paid $19.6 million to acquire a natural gas company, but did not timely and properly report the transaction in its SEC filings." The defendants have agreed to pay over $900,000 in penalties to settle charges. Additionally, Ji has agreed to reimburse "his trading profit of $77,479" to China Natural Gas. The defendants also consented to a final judgment that enjoins them from future violations of the securities laws and bars Ji from serving as "an officer or director of a public company for 10 years." According to the complaint (PDF), Banc de Binary Ltd. "has been offering and selling binary options to investors across the U.S. without first registering the securities as required under the federal securities laws." Additionally, Banc de Binary has been acting "as a broker when offering and selling these securities, but failed to register with the SEC as a broker as required under U.S. law." The SEC seeks disgorgement plus prejudgment interest, financial penalties, and "preliminary and permanent injunctions against Banc de Binary among other relief." For more information, see our recent post on the subject and our review of binary options. Last week, the SEC charged Bruce W. Tomlinson, former vice president of finance, principal accounting officer, and controller of InterMune, Inc., with tipping "his friend and former business associate, Michael Sarkesian, about material nonpublic information concerning the progress of InterMune’s application before a European Union regulatory body to market its drug Esbriet in the EU." After learning the insider information, Sarkesian allegedly "directed the purchase of 400 out-of-the-money call options on InterMune common stock through a brokerage account held in the name of Quorne Limited" and made over $600,000 in illegal profits. Tomlinson had consented to a final judgment that permanently enjoins him from future violations of the securities laws, imposes a five year officer/director bar, and orders him to pay a civil penalty of $616,000. He has also consented to an order that would suspend him from "appearing or practicing before the Commission as an accountant with a right to apply for reinstatement after five years." Previously, a consent judgment was entered against Sarkesian and Quorne Limited in which the defendants were ordered to disgorge $616,000. Our study (PDF) looks at markups and markdowns implied by EMMA trade data. My colleagues have shown an example of how we calculate the markups, but I wanted to illustrate the methodology used to handle the more complex cases that arose when analyzing the trade data. There were effectively four cases that we needed to address. The first case occurs when inter-dealer trades occur on the same business day as the customer trade. In that case we computed the volume weighted average price (VWAP) of the inter-dealer trades and calculated the absolute markup or markdown as the difference between the customer price and the VWAP. This case was covered in the previous example. The second case occurs when there are no inter-dealer trades on the same business day but there are other customer orders on the same day. Specifically, both customer buys and sells occurred on the same day. For example, take the ABAG Finance Authority for Nonprofit Corporations Refunding Revenue Bonds Series 2007A (CUSIP: 00037CML1). In this case, the VWAP of the customer orders is $104.3967. As a result, we estimate the absolute markup charged on the customer purchase is $1.4573 and the absolute markdown charged on the customer sale is $0.7287. We also report a percentile markup, which is the absolute markup divided by the VWAP -- in this case, the percentile markup is 1.3959% and the percentile markdown is 0.6980%. To get the dollar amount of the markup, multiply by the trade amt divided by 100. The customer who purchased the bonds was charged an markup of $146 and the customer who sold the bonds was charged a markdown of $146. The third case occurs when there are no inter-dealer trades or customer trades on the same business day but there are inter-dealer trades within plus/minus two business days. For example, take the ABAG Finance Authority For Nonprofit Corporations Revenue Bonds Senior Series 2007-A (CUSIP: 00037CKT6). The VWAP of inter-dealer trades was $102.7258. 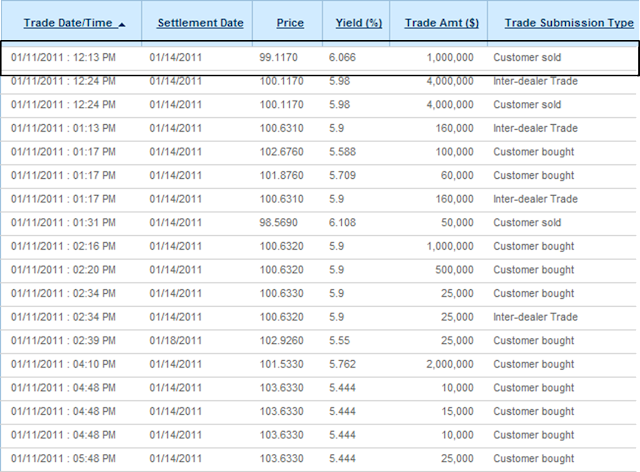 The customer purchase on March 21, 2013 transacted at $104.7570, implying an absolute markup of $2.0312. The dollar amount of this markup is $336. The fourth case occurs when there are no same-day customer purchases or inter-dealer transactions and there are no inter-dealer transactions within plus/minus two business days. In this case, we use the two business day window and look at customer orders. 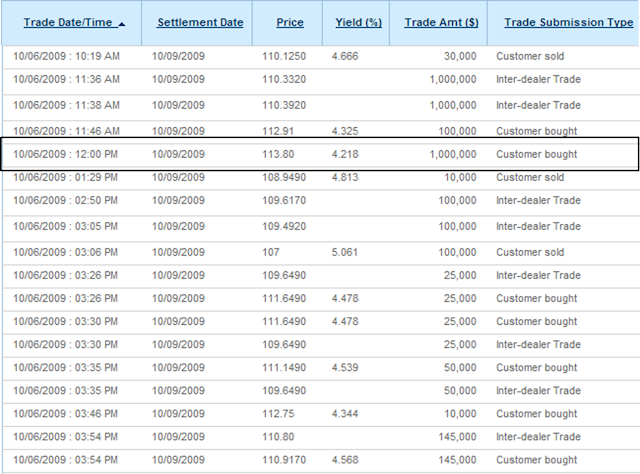 Specifically, both customer buys and sells occurred within plus/minus two business days. For this example, we take the ABAG Finance Authority for Nonprofit Corporations Communities Facilities District No. 2004-2 (Windemere Ranch) 2004 Special Tax Bonds (CUSIP: 000379AU1). In this case, the VWAP of the customer orders is $107.398. The absolute markup charged on the customer purchase is $1.513 and the absolute markdown charged on the customer sale is $1.513 (equal because the trades are of equal size). The dollar value of the markup was $151 and of the markdown is $151. Those four cases covered approximately 93% of the customer trades. If none of these cases are met, then we did not assign a markup or markdown to the customer trade. We've been covering municipal bonds, with a focus on markups, this week on the blog. So far we've discussed some basics, given an example of an excessive markup and introduced SLCG research on excessive markups in municipal bonds (PDF). Given that retail investors may be charged excessive markups when purchasing municipal bonds directly, it may make sense for them to purchase municipal bonds indirectly. Jason Zweig has written a great followup to his coverage of the muni markups issue with a rundown of alternatives for municipal bond investors. These alternatives include municipal bond mutual funds, closed-end funds, as well as exchange-traded funds and could lead to potentially lower transactions costs. Jason points out that mutual funds and exchange-traded funds "can buy wholesale while individuals have to buy retail, which typically is more expensive." The EMMA data does not distinguish between retail and institutional transactions (the distinction is only the size of the trade), but in percentage terms larger trades tend to have smaller markups. In addition, investors in funds can buy and sell their shares at effectively any time with low trading costs, so unless an investor is set on holding a municipal bond to maturity, the liquidity of a bond fund could be a major advantage over holding an individual bond directly. When diversifying within the muni bond asset class, consider diversification by issuer, location and maturity date. One way to diversify your municipal bond holdings is by investing in a municipal bond mutual fund or municipal security ETF. Be sure to research the securities in a given mutual fund or ETF, as well as maturity lengths (longer maturities usually mean greater risk). Be aware that bond funds and ETFs may invest in a narrow group of holdings (only tax-deferred bonds, for instance) and so your diversification may be limited. Bond funds and ETFs can decline in value, and prices fluctuate. Read the prospectus carefully before investing. Vanguard also has a paper (PDF) that describes the advantages and disadvantages of holding municipal bonds directly. They point out that holding individual bonds does give the investor increased control, but usually at the cost of "higher (or additional) transaction costs, lower liquidity, more limited return opportunities, and higher risks." It may be the case that only sophisticated investors, who would place a high value on the control aspects of individual bonds and could diversify those positions themselves, would be better off buying individual bonds rather than bond funds. 1 Fund rankings are based upon total assets given by Bloomberg, LP using the <FSRC> function. In each of these cases, there is more than one fund class that can be purchased. As noted to the lower right, inclusion of any particular fund in this or any post should not be considered an endorsement or investment advice. This week we've been discussing excessive markups in the municipal bond market. Now that we've outlined what excessive markups are, you might be wondering what such markups actually look like in the EMMA data. The markup charged to this customer was more than 20 times the median markup for trades of similar size ($0.15) and was clearly excessive. This markup amounted to a $35,072 transfer of wealth directly from the investor to the brokerage industry. On January 11, 2011, the customer who made the purchase above sold the bonds at $99.117. The following figure shows the EMMA trading activity in the same bond. The average inter-dealer price for this bond was $100.158 and so the customer was charged a markdown of $1.04 per $100 face-value bond. This markdown, approximately 7 times the median markdown, represented another $10,408 transfer of wealth from the customer to the brokerage industry and was also excessive. The customer purchased the bonds at $113.80 and sold them for $99.117, a loss of about $14.683. Judging by the average inter-dealer trades approximately 31% of this loss was due to the excessive commissions charged on the purchase and sale of the bonds. Had the investor known that the roundtrip cost of this 15 month trade would amount to $45,480, the trade would likely have never taken place. 1 The average means the volume-weighted average of inter-dealer prices that traded on the same calendar date. This week, we will be discussing the buying and selling of municipal bonds by brokers on behalf of retail investors. But to start, let's address some basic questions about the municipal bond market. What are municipal bonds and how are they traded? Why do retail investors purchase municipal bonds? Municipal bonds are generally considered very conservative investments. While municipalities have defaulted in the past, their default rate has been relatively low (only 0.15% for rated, investment-grade municipal securities according to SIFMA).2 Also, the income from municipal bonds is tax-exempt for investors who purchase municipal bonds issued in their own state. The municipal bond market has widespread analyst coverage. As just one example, SIFMA publishes a very helpful quarterly report on the municipal bond market which includes market summary data as well as yield and total return analyses. What is a 'markup' on a municipal bond? Dealers sell municipal bonds to investors at higher prices than the dealer could get him or herself in the open market. This difference is referred to as a markup, and represents the profit to the dealer for making the trade on behalf of the investor. Similarly, a markdown the difference in price the dealer receives and the amount credited to the municipal bond owner upon sale of the municipal bond. The Municipal Securities Rulemaking Board (MSRB) has provided guidance for the calculation of markups of municipal bond trades. The MSRB methodology suggests comparing the trading price of a customer municipal bond trade to contemporaneous inter-dealer trades. This can be accomplished using the MSRB's Electronic Municipal Market Access system ("EMMA"), to which all municipal bond dealers in the US must submit trade data, including the trade date, quantity, and price. What are retail investors actually charged for municipal bonds? SLCG's analysis of the municipal bond trades shows that the some purchases were executed well above the prevailing market price. By comparing the observed spread (difference between customer purchase price and the prevailing inter-dealer price) to the distribution of markups charged on similarly sized trades, they find that retail investors were charged between $1.84 billion and $6.45 billion in excessive markups in a sample of fixed coupon issued after January 1995 and maturing after January 2025. While large, SLCG's sample covers less than 30% of the transactions in municipal bond, so total markups may have exceeded $20 billion and excessive markups may have exceeded $10 billion since 2005. How have these excessive markups been allowed to persist? Even though data on municipal bond trades is publicly available through EMMA, there are no current prices quoted for municipal bonds on public exchanges. Therefore, investors have no pre-trade knowledge of the market price for their bond. This lack of pre-trade transparency means that investors don't always know what the markup was on their trade, or what the prevailing inter-dealer prices were when it was executed. For more details, please see SLCG's research paper on markups in the municipal bond marketplace. You can also find coverage of this paper in Jason Zweig's story for the Wall Street Journal. 2 For example, the recent bankruptcy of Stockton, California and the notorious bankruptcy of Jefferson County, Alabama). Today SLCG posted a new working paper titled "Using EMMA to Assess Municipal Bond Markups". In it, our colleagues Geng Deng and Craig McCann report a veritable pandemic of excessive markups charged to retail investors in the municipal bond market. This work has been highlighted in a recent Wall Street Journal article by Jason Zweig. Jason's looked at markups generically in the past and we're happy this story has caught his attention. The total amount of excessive markups charged to retail investors may have exceeded $10 billion since 2005. We think these findings have important implications for the municipal bond market -- and for retail investors in particular -- and so we are devoting next week to discussing the municipal bond market in the context of these findings, offering some background and elaboration of the findings in the new paper. Please feel free to add to the discussion in the comments section of each post, or to contact us directly with questions or suggestions. The SEC has issued an Investor Alert (PDF) on binary options, which are derivatives that pay out a fixed amount if an event happens and zero if it does not. We've covered binary options before, so do check out that post for a detailed background and an Excel spreadsheet that explains how binary options work in some detail. Much of the binary options market operates through Internet-based trading platforms that are not necessarily complying with applicable U.S. regulatory requirements and may be engaging in illegal activity. The Alert was issued simultaneously with charges against a Cyprus-based firm who allegedly sold them illegally to US investors through just such an online exchange. That firm, Banc de Binary, was charged with selling binary options since 2010 "without first registering the securities as required under the federal securities laws." The CFTC is also investigating Banc de Binary for related violations of its rules relating to off-exchange trading of commodity options contracts. 1 Perhaps the most well-known example is InTrade (recently shut down). The SEC voted on Wednesday on changes to rules governing money market funds (MMFs). As we discussed on Tuesday, MMFs are considered low risk, low return investments similar to bank accounts, but experienced 'runs' during the financial collapse of 2008 that helped freeze financial markets. The SEC's new rules hope to prevent such runs by changing how MMFs report their assets. As widely suspected, the changes target MMFs favored by large institutional investors (dubbed 'prime funds'). While many small retail investors have some allocation to MMFs, the large institutional investors are thought to be most likely to cause a run because only a relatively small number of them need to withdraw at once to lead to unsustainable outflows. Prime funds invest primarily in short-term corporate debt, rather than cash or government securities, and so are riskier than other MMFs. Prime funds also do not limit investor outflows to $1 million per day, as retail MMFs do. Prime funds account for about 35% of the MMF industry. Prime funds, like other MMFs, typically keep their net asset value (NAV) at $1. This means that buying or selling a MMF never incurs a taxable event, as there is no capital appreciation or loss to report. However, it also means that losses on the fund's assets are in some sense hidden from investors, which is thought to have contributed to the runs experienced in 2008. The SEC's proposed rules require prime funds to 'float' their NAV, effectively letting it deviate from $1 if the value of its assets rises or falls, much like other mutual funds. Floating the NAV should better inform investors about the risks associated with investing in MMFs and will enhance the transparency of these products, thus reducing the incentive to run. But the only way to ensure that a run is stopped in its tracks is to permit gating. Also included in the proposed reforms are increased disclosure requirements. For example, MMFs would now be required to disclosure "historic instances of sponsor support". In addition, the reforms would remove the 60-day delay of public disclosure of form N-MFP filings that disclose monthly portfolio holdings. For the next 90 days, the SEC will hear public comments about the proposed changes before they go into effect. Reactions to the rules has been mixed, and the proposed changes are less extensive than those proposed last fall by the Financial Stability Oversight Council. But the need for money market reform has been noted by both industry and investor advocates, and may now be close to reality. Final judgments were entered against Kathleen Halloran and George Behrens, former CFO and former Treasurer of Nicor, Inc. respectively, for allegedly overstating "Nicor's financial performance...by, among other things, making or authorizing false and misleading statements about Nicor's performance in multiple filings with the Commission." The SEC charged the defendants with violating various sections of the Securities Act. Halloran and Behrens consented to the final judgments, which order them to pay over $400,000 combined in disgorgement and prejudgment interest. In 2010 a final judgment was previously entered by the court against another defendant, "Thomas Fisher, Nicor's former Chief Executive Officer." According to the complaint (PDF), "Laidlaw Energy Group and its CEO, Michael B. Bartoszek, sold more than two billion shares of Laidlaw's common stock...at deep discounts from the market price." Laidlaw allegedly did not "register this stock offering with the SEC, and no exemptions from registration were applicable." Furthermore, Bartoszek allegedly "knew that the purchasers were dumping the shares into the market usually within days or weeks of the purchases to make hundreds of thousands of dollars in profits." In June 2011, the SEC suspended trading in Laidlaw stock. Bartoszek and Laidlaw have been charged with violating various sections of the Exchange Act and Securities Act. The SEC seeks payment of disgorgement, interest, and financial penalties and injunctive relief against both defendants as well as a penny stock and officer and director bars against Bartoszek. According to the complaint (PDF), Thomas Rubin, Westcap Securities, Inc.'s former CEO, and Christopher Scott, Westcap Securities, Inc.'s former CCO, engaged in "a continuing series of schemes with others to conduct unlawful unregistered offerings and/or fraudulently manipulate the market for the common stock of four microcap companies." The complaint also charges Rubin and Scott with selling stock in unregistered offerings through their "respective related entities, BGLR Enterprises, LLC and E-Info Solutions, LLC." The final judgments impose permanent injunctions against all of the defendants as well as order Scott to pay almost $200,000 in disgorgement, penalties, and prejudgment interest. The court will determine "if and to what amount monetary relief will be ordered against Rubin." Additionally, the court entered "ten-year penny stock bars against Rubin and BGLR Enterprises, along with five-year penny stock bars against Scott and E-Info Solutions as well as a five-year officer and director bar against Scott." According to the complaint (PDF), Detroit Memorial Partners, LLC and its managing member, Mark Morrow, engaged in a scheme in which DMP issued "approximately $19 million in fraudulent promissory notes and...[sold] $4.5 million in equity interests." Furthermore, DMP allegedly made "material misrepresentations and omissions to investors who purchased the promissory notes and equity interests." The defendants told investors that funds would be used to "acquire and manage cemeteries" but funds were allegedly used "to fund Morrow's personal equity interest in DMP, for high risk trading in securities and to pay interest owed to other DMP note holders." Angelo Alleca, a business-associate of Morrow's, sold the notes through his investment advisory firm, Summit Capital. The SEC seeks injunction against the defendants, as well as payment of disgorgement, civil penalties, and interest. Alleca and Summit are the subjects of another lawsuit, SEC v. Alleca, that charges "them with operating a massive Ponzi scheme." According to the complaint (PDF), PACCAR, "a Fortune 200 company that designs, manufactures, and distributes trucks and related aftermarket parts," failed to maintain effective internal accounting controls that "kept the company from adhering to various accounting rules." PACCAR and its subsidiary, PACCAR Financial Corp, "failed to provide complete information about their respective loan and lease portfolios, and PACCAR overstated some loan and lease originations and collections at two foreign subsidiaries in its statement of cash flows." Additionally, the complaint alleges that PACCAR "made inaccurate statements to the SEC's Division of Corporation Finance regarding its processes for calculating the specific reserves on its impaired receivables." PACCAR has been charged with violating sections of the Exchange Act, and has agreed to the entry of a permanent injunction as well as agreed to pay a $225,000 penalty to settle the charges. According to the complaint (PDF), Robert A. Gist and Gist, Kennedy & Associates, Inc. defrauded "at least 32 customers out of at least $5.4 million while acting as an unregistered broker from approximately 2003 to the present." The SEC alleges that Gist "used the funds for his personal expenses, for the payment of purported dividends and proceeds from securities sales that he falsely claimed to have purchased on behalf of his customers, and for the operation of a company that he controlled until early 2013 known as ENCAP Technologies, LLC." Gist allegedly created false account statements that he then gave to his customers. Gist and Gist Kennedy agreed to settle the charges by consenting to an order that permanently enjoins them from future violations of the Exchange Act, holds them "jointly and severally liable for $5.4 million in disgorgement plus prejudgment interest, impos[es] civil penalties to be determined upon motion of the Commission, freez[es] the Defendants’ assets, and provid[es] other relief." ENCAP has been named as a relief defendant and the complaint seeks "disgorgement from it of unjust enrichment in the amount of at least $2.2 million plus prejudgment interest." Nowadays, there are several ways that retail investors can purchase risky investments which would typically be considered unsuitable. For example, many exchange-traded funds (ETFs) use derivatives to offer investors access to risky asset classes (such as CDOs) or complex options positions (such as covered calls). Since ETFs can be bought and sold like any other listed stock, essentially any investor can now take covered call positions regardless of her understanding of options. There is even talk of allowing hedge fund investments in mutual funds (such investments are typically restricted to wealthy and sophisticated investors). But trying to sell restricted hedge fund units to retail investors is nothing new. Take for example the Mariner Access Fund and the Mariner 2X Access Fund offered through the Merrill Lynch HedgeAccess program. The HedgeAccess program was designed by Merrill Lynch for the purpose of facilitating access to hedge third-party funds at reduced minimum investment requirements. 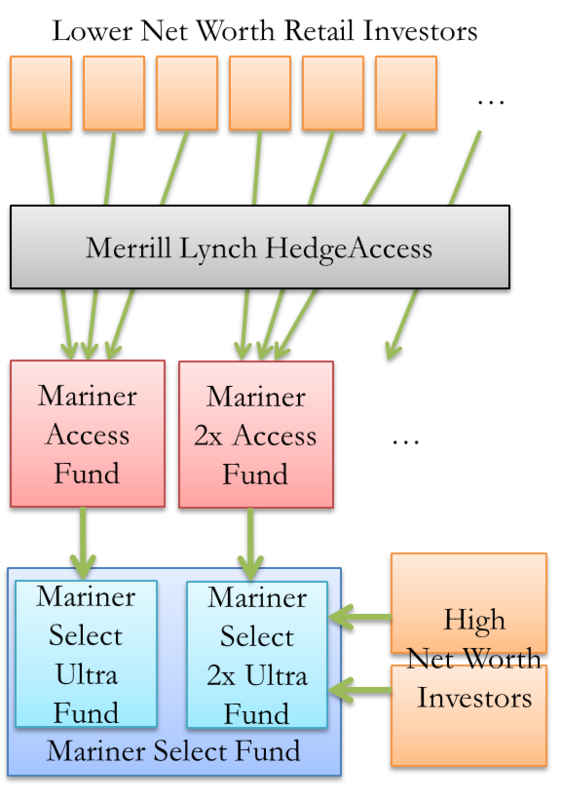 The Mariner Access Fund and the Mariner 2x Access Fund were feeder funds for third-party hedge funds Mariner Select Ultra Fund and Mariner Select Ultra 2x Fund, respectively. Each of these third-party funds invests through a master fund called these Mariner Select Fund. Mariner Investment Group, Inc. served as the investment manager for the master fund. The Mariner Access Fund and the Mariner 2X Access Fund effectively bypass minimum investment requirements of the Mariner Select Ultra Funds to allow investors with a lower net worth to access these funds. According to their SEC filings, a minimum of $100,000 was required for investing in both the Mariner Access Fund and the Mariner 2X Access Fund while the Mariner Select Ultra Fund and the Mariner Select Ultra 2x Fund each required minimum investments of $5,000,000. * The combined interests sold by the access funds are approximately $408 million according to their latest SEC filings (available here and here). The Mariner Investment Group funds, as is typical of hedge funds, have virtually no limits to their investment strategies. The funds may allocate their cash balances to investments as speculative as distressed securities--that is, the debt or equity of companies whose business is impaired by high debt or illiquidity and that may require debt restructuring. Hedge funds often claim that their returns diversify stock and bond portfolios, but this claim is dubious. Hedge fund managers have significant leeway over how they report returns, which are frequently reported on a lag (are either "stale" or "managed"). This can lead to Sharpe ratios that are overreported by as much as 65%. ** This reporting bias also results in a decreased correlation with traditional asset classes and a decreased volatility of reported returns,*** which will overstate diversification benefits and underestimate risks. Unsophisticated investors would likely not appreciate these esoteric facts and could be duped into hedge fund investments by the misuse of simplistic risk measures. So even if Merrill Lynch's claims that the HedgeAccess program would have benefits for investors such as "advantageous redemption and exchange privileges compared to investing in the Underlying Funds directly," this does not change the fact that investments in the underlying funds were incredibly risky and opaque. The reduced minimum purchase requirements leave open the question of whether or not such 'access' funds are suitable for the targeted investor. Indeed, it also questions whether ETFs and mutual funds should purchase such assets, given that their shares could be purchased by unsophisticated investors. *Direct investment in the master fund (Mariner Select Fund) required a minimum investment of $1,000,000. ** Lo, “Statistics of Sharpe Ratios” Financial Analyst Journal (July/August 2002). *** See, for example, Asness, Krail and Liew, “Do Hedge Funds Hedge?” Journal of Portfolio Management (Fall 2001) and Brooks and Kat, “The Statistical Properties of Hedge Fund Index Returns and Their Implications for Investors” The Journal of Alternative Investments (Fall 2002). Yesterday, the Financial Industry Regulatory Authority (FINRA) announced fines totalling more than $2.1 million levied against Wells Fargo and Banc of America. In addition, FINRA has ordered the two institutions to pay restitution in excess $3 million to customers who suffered "losses incurred from unsuitable sales of floating-rate bank loan funds." A floating-rate bank loan fund is a mutual fund that mainly invests in floating-rate high-yield senior secured loans. The floating-rate on the underlying loans typically resets every month or every quarter and is often quoted as a spread above some reference rate like LIBOR. The funds typically have "relatively low interest rate risk but significant credit and liquidity risk." The credit risk stems from the fact that the debtors are generally rated below investment-grade. According to their Letter of Acceptance, Waiver and Consent (PDF), Wells Fargo Investments, LLC (now Wells Fargo Advisors, LLC) "made unsuitable recommendations to customers to purchase floating rate loan funds." During 2007 and 2008, sales of these funds constituted a significant part of total mutual fund sales (much more than competing brokerage firms). According to the Letter, the product team became concerned in August 2007 when it was found that ""financial advisors are positioning these funds as an alternative to Bank CDs or money market funds instead of part of an overall diversification strategy." The product team's recommendations were largely ignored and unsuitable recommendations continued. As the value of the funds subsequently declined, hundreds of investors collectively lost more than $1.9 million. Wells Fargo has been fined $1.25 million for their supervisory failures and has been ordered to pay restitution to the affected customers. Banc of America Investment Services (now Merrill Lynch) submitted a similar Letter of Acceptance, Waiver and Consent (PDF). According to the letter, Banc of America "did not provide guidance to its employees about the special features, credit risk, or liquidity risks of floating rate loan funds, or the customers for whom these products would be suitable" and failed to alter their supervisory practices even after the increased volatility of these funds following the financial crisis. Hundreds of customers collectively lost approximately $1.1 million in these unsuitable transactions. Merrill Lynch has been fined $900,000 and has been ordered to pay restitution to the affected customers. Investors need to ask their broker the question: if I'm getting higher returns, what additional risk am I bearing? Tomorrow, the Securities and Exchange Commission will vote on new rules pertaining to the $2.6 trillion money market fund (MMF) industry. The SEC hopes that the new rules will safegaurd against future runs on MMFs, such as those that occurred during the financial crisis after the collapse of Lehman Brothers. A "run on" MMFs occurs when many investors (or a few very large investors) attempt to redeem their shares in near unison, resulting in significant liquidations of MMF holdings. A money market fund is an open-end mutual fund that is subject to the restrictions imposed by Rule 2a-7 of the Investment Company Act of 1940. The holdings are generally restricted to "government securities, certificates of deposit, commercial paper of companies, or other highly liquid and low-risk securities." The holdings must be sufficiently diversified (less than 5% from a single issuer) and must have a weighted-average maturity of 60 days or less. MMFs, which are often compared to bank accounts, tend to have relatively low yields but little risk of loss. Currently, MMFs attempt to keep a stable net asset value (NAV) of one dollar. When a MMF's investments are performing well, the fund will pay a higher dividend and have a higher yield. If the portfolio experiences shortfalls, the fund sponsors will often eat the losses so that the fund will not lose face in the eyes of their investors. If the NAV of a MMF does fall below $1, the fund has "broken the buck". This has only occurred twice since Rule 2a-7 was introduced to the Investment Company Act of 1940, but an estimated 21 MMFs would have during the financial crisis without government assistance. The SEC has been looking to reform the MMF industry to reduce structural instabilities and to reduce the need for government support. According to Reuters, new rules to decrease the likelihood of runs could take the form of "capital buffers and redemption holdbacks, or alternatively, a switch from a stable $1 per share net asset value to a floating NAV" and are expected to target "prime funds used by institutional investors, who are considered most likely to incite runs on money funds." The idea is that since institutional investors tend to have the largest holdings of MMFs, they are most likely to cause a run if they were to withdraw those assets all at once. Which is precisely what happened in the financial crisis. The Reserve Primary Fund was a MMF with over $64.8 billion in assets in 2008, but held $785 million in Lehman commercial paper. When Lehman filed for bankrupcy, the fund valued these holdings at zero, and therefore the NAV of the fund was reduced from $1 to 97 cents--'breaking the buck' for only the second time in US history. Investors tried desperately to redeem at $1, causing a run. A November 2012 Treasury Department report (PDF) gives some hints as to what form these rules might take. The most promising alternative seems to be the destabilization of MMF NAVs. In the approach, investors would bear the risk of a decrease in NAVs, but there would be less sensitivity of so-called cliff effects: when the stable NAV becomes destabilized by a breaking of the buck. This approach would lead to a change in the way MMFs value their holdings (becoming more consistent with other mutual funds) and potentially to changes in tax and accounting rules. For more information concerning this alternative, see the Treasury's discussion of "Alternative One" in the report. As Walt Bettinger of Schwab points out, the stable NAV of MMFs prevents investors from creating tax events when shares are sold. If the NAV was no longer stable, retail investors buying shares for a price that does not correspond to their sale price would be exposed to capital gains taxes. The MMF industry is concerned that the loss of this attractive feature will encourage investors to leave MMFs and park their cash in other securities. Furthermore, there seems to be no straight-forward approach to implementing stable NAVs for retail investors while simultaneously allowing a floating NAV for institutional investors. We'll have a post once the SEC has reached a consensus over the new MMF rules that will include commentary on their implications for retail investors.